Time is often against me as I am a rather busy chap but when time allows I like to chuck some dice, move my miniatures and explore missions and scenarios. All of this is part of my passion of Miniature Wargaming. Read about what I have been up to in these posts…oh and yes I always lose! 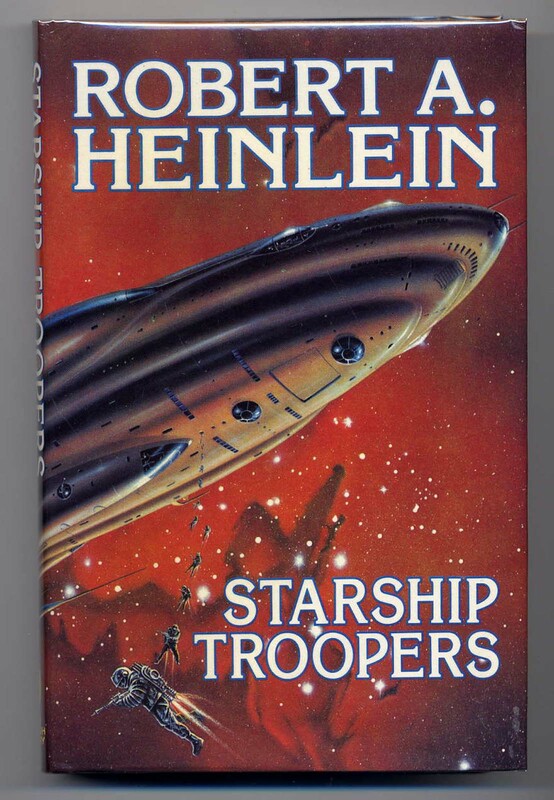 There is no doubt that Robert Heinlein wrote a masterpiece of science fiction literature in 1959 with the publication of Starship Troopers. It is a military science fiction novel which is told in the first-person narrative about a young soldier named Juan ‘Johnnie’ Rico and his exploits in the Mobile Infantry, a futuristic military service branch of ‘The Federation’ who are equipped with ‘powered armour’. Rico’s military career progresses from recruit to non-commissioned officer and finally to officer against the backdrop of an interstellar war between mankind and an arachnid species known as ‘the Bugs’ and also ‘the Skinnies’. Rico and the other characters discuss moral and philosophical aspects of suffrage, civic virtue, juvenile delinquency, corporal punishment, capital punishment, and war. It is a book of two aspects. The first being the action and technology of the Mobile Infantry and the second being the structure of The Federation. I will not go into detail about the moral aspects of the book as it is not my purpose here but I will say that I agree with many points the book makes (not all) and secondly to say that in a social media forum setting invariably makes one suffer from Godwins Law and when posting this article I am sure I will get the same. I recently listened to the book as an audio through my audible account and it has been years since I last turned the pages of my own paper copy. Critics of the book have a point when they refer to the lack of a dense plot and deep characters but there is no denying the success of the book much of which was actually to Heinlein’s surprise. I agree that the plot is very thin but I think that it actually does not matter all that much as the career and thoughts of Rico are the prime mover in the text. The purpose of this short essay however is not to discuss the book itself but more to see its influence upon the industry where I make my living; that of miniature wargaming and science fiction wargame rules. It cannot be argued that Starship Troopers has not had a big influence upon science fiction in terms of books, films and more which followed it. This was in the 1960’s with The Forever War by Haldeman and also Harry Harrison’s lower brow Bill the Galactic Hero both putting their own takes on Starship Troopers. These served to flesh out and humanise the core ideas of the original book in different directions and indeed to this day authors such as John Scalzi pattern their tales upon Heinlein and his work. A whole generation grew up with the book and then an Avalon Hill Board Game as well as early home computer games with the setting. But it was in 1986 for wargaming in particular that arguably the greatest combination of events EVER for science fiction wargaming occurred with the release of the seminal Aliens movie. Aliens directed by James Cameron riffs heavily upon Starship Troopers and borrows lines and concepts from it such as the infamous ‘Bug Hunt’. This powerful combination locked into the mind of wargamers just want a possible future would be and to this day it is one of the most reliable narratives for scenario settings including the recent Osprey book Bug Hunts by Mark Latham which is literally this combination. While there are other powerful combinations such as that of Dune and the original Laserburn into Rogue Trader one and the Japanese Anime Mecha into Techomancy one I would say that Starship Troopers and Aliens combine into the biggest for wargaming overall. 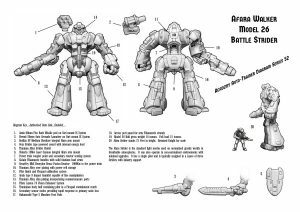 Powered Armour features very heavily in science fiction wargaming as does chisel jawed alpha men with no deep personalities both are from this start. An alien enemy implacable and totally unlike us has a beginning in Starship Troopers too. In fact Yoshiyuki Tomino, the creator of the mecha anime TV series Mobile Suit Gundam (1979) cited Starship Troopers as an important inspiration. He coined the term “mobile suit” used to name the piloted mecha from the anime series as a reference to the novel’s own ‘mobile infantry’. All You Need Is Kill by Hiroshi Sakurazaka is a newer example. In direct terms the game by Mongoose Publishing in 2005 which picked up on the 1997 movie written by Ed Neumeier and directed by Paul Verhoeven license is the biggest thing done in purely wargaming terms with Starship Troopers. Though I enjoyed the film the movie and the game have little to do with the original book. For Science Fiction Wargaming two core aspects of the book shine through as pioneering. The innovation of powered armour exoskeletons used by the Mobile Infantry. Suits controlled by the wearer’s own movements, but powerfully augmented a soldier’s strength, speed, weight-carrying capacity (which allowed much heavier personal armament), and jumping ability (including jet and rocket boost assistance), and provided the wearer with improved senses (infrared vision and night vision, radar, and amplified hearing), a completely self-contained personal environment including a drug-dispensing apparatus, sophisticated communications equipment, and tactical map displays. Their powered armour made the Mobile Infantry a hybrid between an infantry unit and an armoured one. Wargamers adore all kinds of amour in this fashion. The other core was that of space-borne infantry. The heavily mechanised units of M.I. troops were attached to interstellar troop transport spacecraft, which then delivered them to planetary target zones, by dropping groups of Mobile Infantrymen onto the planet surface from orbit via individual re-entry capsules. The uses for such a force—ranging from smash-and-burn raids, to surgical strikes, conventional infantry warfare, and holding beachheads—and the tactics that might be employed by such soldiers are described extensively and inspire wargamers. Many wargame miniature producers make miniatures which borrow from Heinlein. Armoured Steel Gorillas as the novel puts it as common as ‘Power Armour’ or ‘Mobile Suits’ or ‘Battlesuits’ or ‘Dreadnoughts’ or ‘Mates’ etc giving a single man the mighty of a whole platoon of conventional troops. I will not quote makers since there are too many and indeed some may not even realise the origin since as time moves on each subsequent generation borrows or is inspired by the last. HALO with its ‘Spartans’, now a tabletop game by Spartan Games in the UK, owes its lineage to the Mobile Infantry in this sense. I will say that my own creations in wargaming have been influenced by Starship Troopers though not directly up to this point. I have made use of powered armour and of deep space transports to deliver soldiers to the warring front. But in that I am common for this is the very crux of sci-fi to many. In conclusion Starship Troopers is a vital thread to wargaming without which there would be a mighty big gap in both the technology commonly regarded as military for miniatures and games but also in the terminology and mindset of wargamers for the portrayal of alien life as a hive mindset. In fact when you take out everything that came from Starship Troopers the cupboard is rather bare and barren. The book is the origin and jumping off point for a thousand other works which lead us to now. 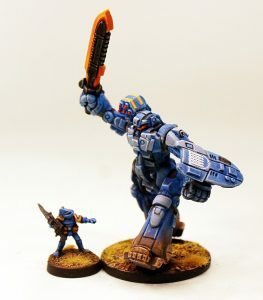 Over on the blog for The Ion Age I published a little story about Caracan the Strider; a light mecha used in the Patrol Angis game system in 15mm scale. I write a lot of fiction and non-fiction but on this occasion I decided to set myself a challenge in that I would try and create 2000 words of fiction in less than two hours with only five minutes of editing afterwards and then straight to publish. I just managed it and the article went live half a day later. Responses have been kind and nice and sure I made a couple of mistakes but all in all it worked. Have a look and enjoy if you like science fiction with a military leaning. Writing Two Thousand Words in Two Hours…How? So. You might be thinking how do I write a story of 2000 words in 120 minutes. Well there is no magic formula really. From my point of view I have and do write a lot so my typing speed is faster than typical. It helps I use a wired full size keyboard as smaller boards and wireless can pose problems and slow you. I am a great believer in the motto of ‘just start’ as it works. When you try this just begin with one sentence which sums up what you are going to write about. Such as ‘This mecha, what is it, who is its pilot and where are they fighting’. Then drop a few lines, I use open office mainly in single page view, and type in salient points of the story you are now thinking of. So any action or dialogue or description you intend to hang the story on. It could be the opening or last line for example. By this time you are five minutes in and have the skeleton of a two thousand word tale. Now. Do not stop. Type typing and ignore everything else if you can. Take your salient points and begin to build on them with paragraphs. Name your characters and identify places. Ignore the beep of the phone, the call from mates and such (if you are on fire then put it out of course!) and carry on. Frankly I am ignoring Messenger and Whatsapp right now! By the time you are an hour in you should have nearly a thousand words and a story that would work if left as it is. It would be somewhat vapid and missing elements but it exists. Now take a minute and read it back. Pompous eh? What am I like. A fast thinking, fast typing, veteran scribbler telling you it is this easy. Well it ain’t easy and I got there with seconds to spare. It is perfectly fine to try for 1000 words or for three hours when you begin and I recommend you try and do an exercise of 500 words several times if you are very new to this. If you manage to craft a tale then you deserve some applause as many people simply never do it. I began with books like the one above and they are well worth reading. I will end on this notion. Begin with the End clearly in Mind. It makes all the difference. Asked for a new way into Flintloque…delivered! 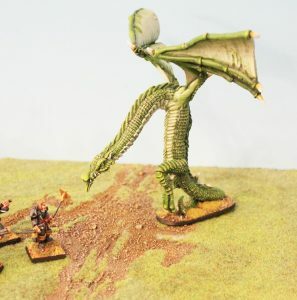 This week my latest project was breathed to life and appeared on the Alternative Armies website. 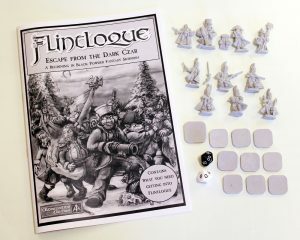 A new beginners entry into Flintloque the Skirmish 3rd edition. I had been asked many times across last year by wargamers ‘how do I get into this excellent setting!’. After a long bit of thinking and an idea to try out some new concepts I came up with 5024 Escape from the Dark Czar. 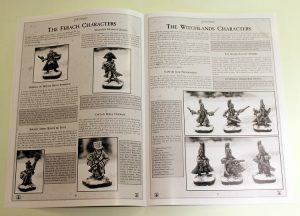 A complete beginners set with booklet, miniatures, bases and dice. You can see it on the website from Friday 27th January. The booklet itself is twenty pages and builds upon the Witchlands campaign setting begun by Mike Roberts and the core engine of 3rd edition worked up by Mike White. 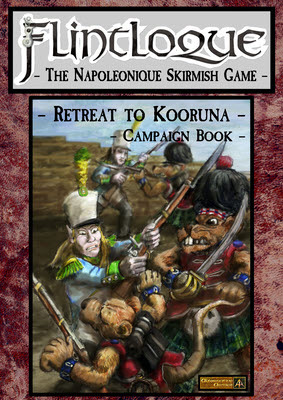 An introduction to the campaign followed by character profiles and then the core rules of play after which are three small scenarios for use with the miniatures and then two pre-filled rosters; one for each side. It is an excellent looking tightly packed booklet featuring the artwork of my good friend Edward Jackson on its cover and in its inner pages. Sam Croes the lead designer at Alternative Armies came up with the ideas for the miniatures in the set. 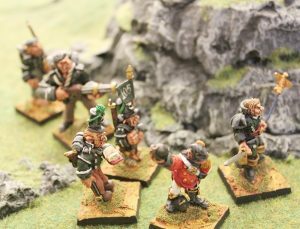 We decided to produce the ten miniatures in resin and importantly in bulk allowing us to keep the price down on this introduction for wargamers. However it is not likely I will commission more resin infantry for Flintloque as it is a white metal range, which I love, and this was an experiment after all. We will stick to using resin to keep the weight down and price of things like Trolka and Cavalry Mounts. That said they are fantastic figures indeed. Full of character touches. The Ogre is my favourite. 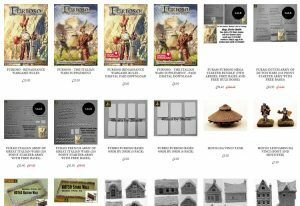 I also took this chance to collate the massive folder of free files which exist for Flintloque and Slaughterloo and in the process create a mighty stack now online for download for free. See the same page on the website for the download link. It is some 95mb in size and represents some four years work on my own and others part. I hope that you enjoy this new beginners set. I had a lot of fun writing it and playtesting it last autumn. On other topics. I do not update this blog all that often. I just do not have the time down to my work, my family and so on. There are only so many hours in the day. So I have a plan for this year…it will come in stages and start soon. Orcs in the Webbe Advent 2016 – Sharkes Wyvern! 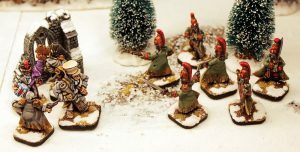 Now online at Orcs in the Webbe as part of the 2016 Advent Calendar a free Flintloque scenario written by myself as my own personal entry on the calendar for Day 10. Sharke’s Wyvern! The scenario sees Captain Rekhardt Sharke along with his Chosen Orcs taken on a giant monster after being tricked by a Dark Elf noble into a spot of ‘bird hunting’. It includes the scenario but also the rules for including this monster in your games of Flintloque. 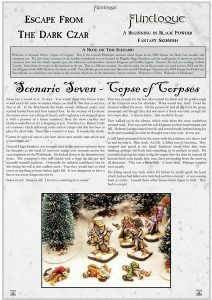 You can see it on Orcs on the Webbe and you can see it on Alternative Armies blog as a download PDF too. I had great fun writing and playing this scenario with new rules and getting the miniatures for Sharke out of the box again for the fight. I am currently working on something major for Flintloque that will be out and about in January 2017 but there will be more on this during December. I hope you enjoy the read and the photos which were taken too.